- Insert radius: RC0.5~RC1.0, various corner radius inserts can fit on same holder. - Combination corner rounding and 45° chamfering application on the same insert. - High cutting speed & feed rate. - Very small X offset, excellent for contour chamfering. - Cost saving! 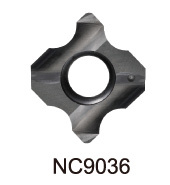 Utilize standard NC Spot Drill holder, also can fit with CT insert ( suitable for spotting, chamfering and engraving ) and corner rounging insert. -Various corner radius inserts can fit on same holder, using standard NC Spot Drill shank. -The small X offset allows for profiling in small corners. NC9036 : K20F grade, for non-ferrous material. -Sharp edge produces excellent surface finish. 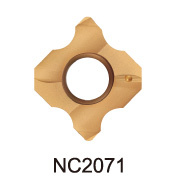 -NC2071 : K20F grade, for unhardened steel & cast iron. -NC9036 : K20F grade, for non-ferrous material.